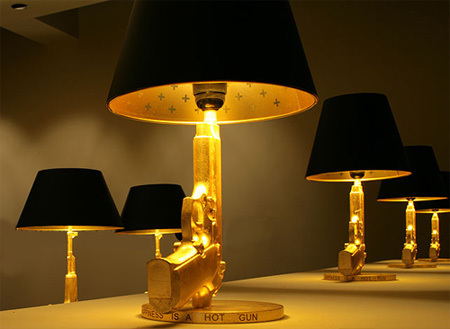 Collection of creative gun shaped gadgets and unusual product designs. The holster wallet is actually comprised of three pieces, a wallet, a small bag, and a “V” connector, which happen to form something that looks suspiciously like a shoulder carry case for a gun. Creative retro game console mod. 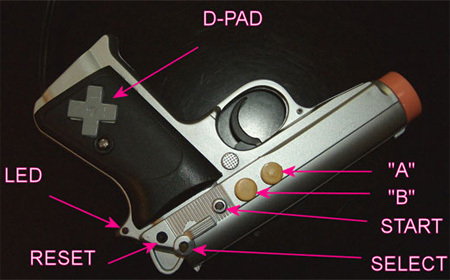 The modder managed to fit a Nintendo NES 8-bit game system into a light gun controller. 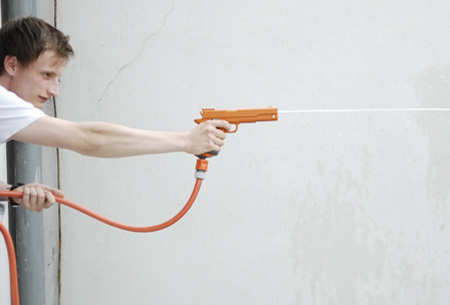 Have some fun with Garden Gun 5.1 while watering your garden. 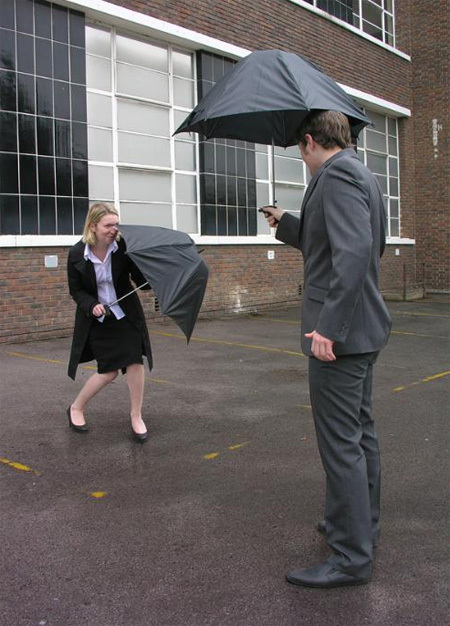 Squirt gun mounted on the handle of an umbrella that self-recharges from collected rainwater. 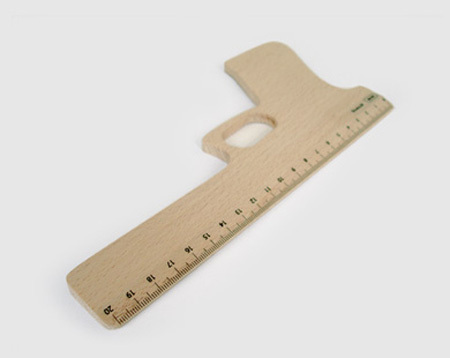 Creative hard wood ruler that is shaped like a handgun. 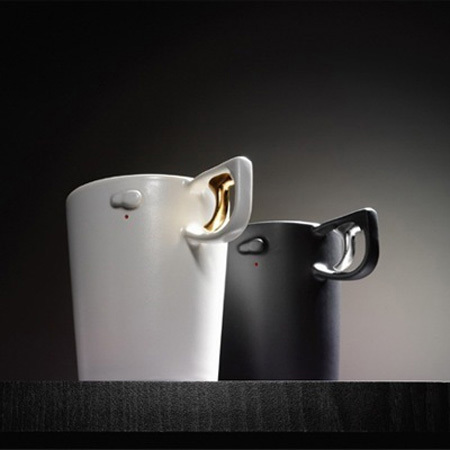 Porcelain Pistols are replicas of James Bond’s Walther PPK and its contemporary sister, the P99. 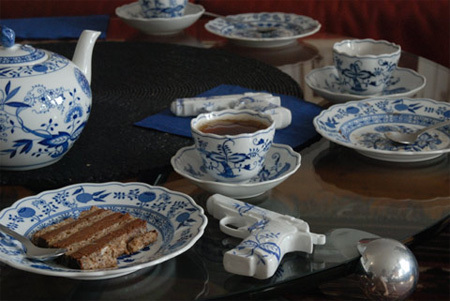 These fragile weapons are hand-painted in the style of classic tableware motifs. Go slow in life, kill time with a cup of coffee. Learn how to turn an airsoft handgun and a bluetooth headset into a fun, fully functional handset for your iPhone. 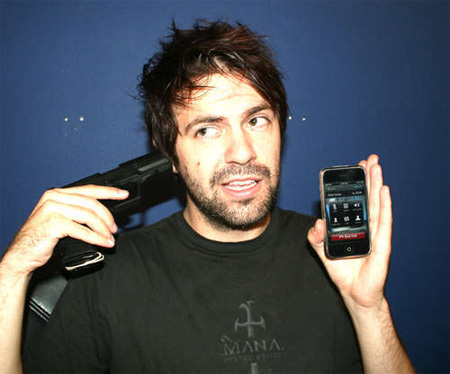 Pull the trigger to receive calls and to, um, end them. Listen through the barrel, and talk into the grip. 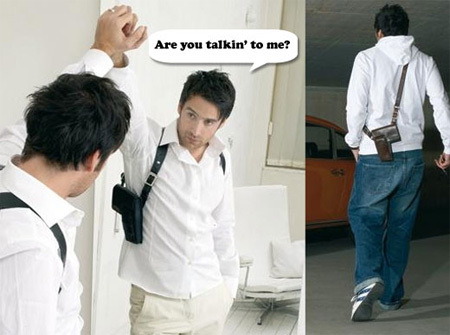 You can carry a gun, but it’s preferable to wear one. 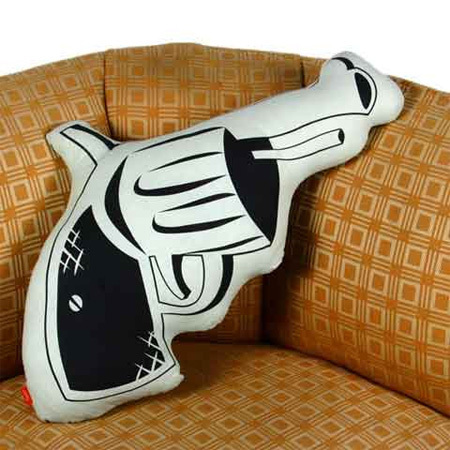 Rest your weary head on this comforting gun pillow. Chanel Cruise ‘Miami Vice’ shoe inspired by an image of a gun. 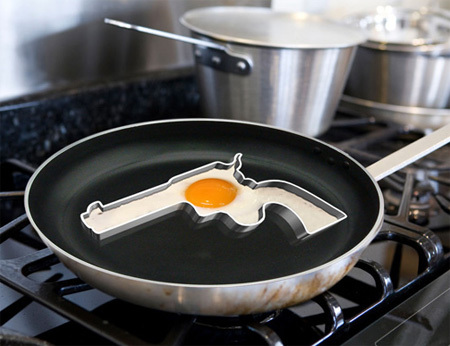 Egg fryers that help you cook your eggs in the shape of a gun. 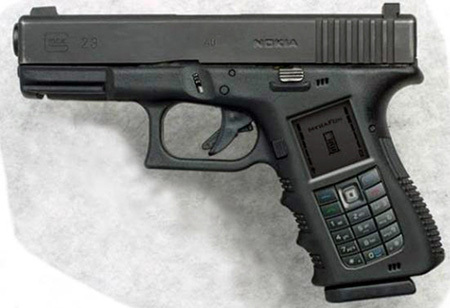 Unusual Nokia gun cell phone concept design. 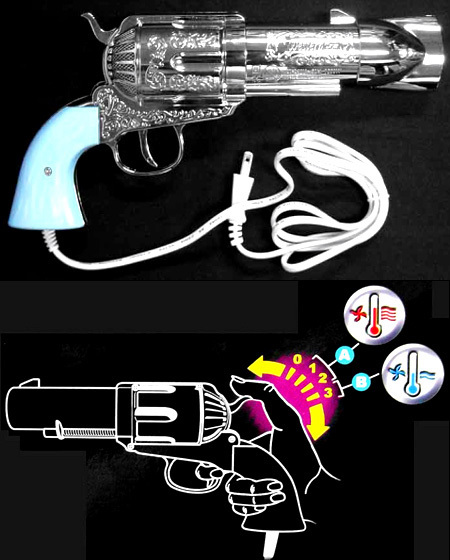 If you feel like “shooting” your hair dry, then gun hairdryer is perfect for you. 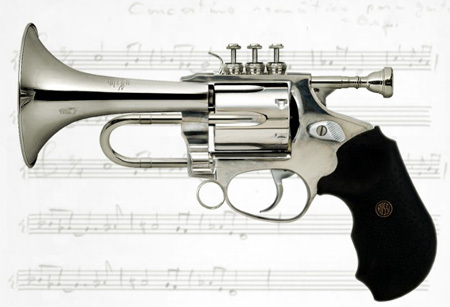 Photoshop Contest: The goal was to combine any weapon and any musical instrument. 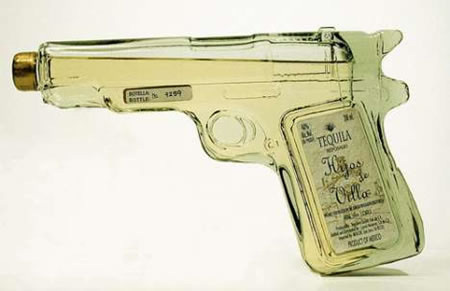 Tequila Gun looks very similar to .45 but instead of bullets it’s loaded with 200 ml of genuine Mexican tequila. 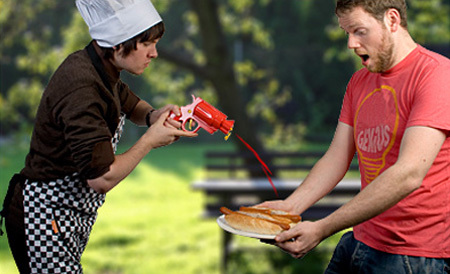 Sausages, chips and burgers will be unable to dodge the splodge once you arm yourself with a Condiment Gun. Although it kills me to say it. Phillipe Starck steals the show with that lamp design every time. Didn’t I see Jackie mason using one of those Hair dryers in Caddyshack 2? I liked the egg fryer shapes. 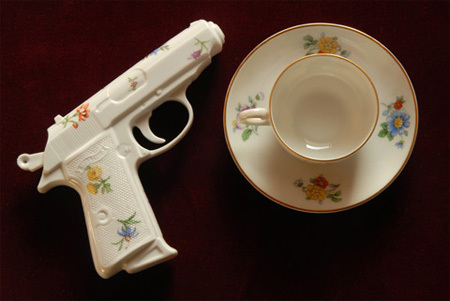 i love the porcelain gun – where can i purchase one? all these are pretty cool – the instruments look awesome. Yeah, the blow dryer guns are way old school. My pops used to have one back in late 70’s. Wish i had it now. My hair looks like a$$. Guns don’t kill people, eggs kill people. Remember that Mr’s Black and Decker were cleaning pistols when they had the idea to put a pistol handle onto an electric chest drill. Power drills have never been the same. Some of the above concepts are very bad ideas and are likely to get you shot by a twitchy policeman. The headset idea is just awesome. I wonder how long you would last talking in public before somebody wrestles you. While they are clever ideas, if you have been around or are hypersensitive to gun violence…it’s hard to get on board with any of them. 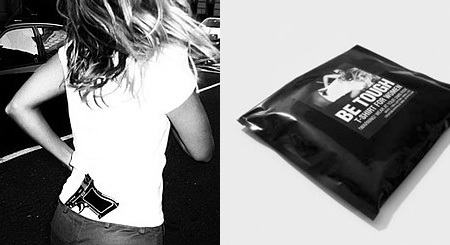 I’m all for a good idea, these are just hard to get into. I guess I’m a little disappointed in the fact that people find humor in things that are attributed to violence. It’s amazing how far we have come in society developing and designing products; and for some reason, our morals and values have deminished. Interesting…. I want the ketchup one! Ketchup Gun pics are badly photoshopped. I am not denying the fact that the gin exists, just the quality of pics. I LIKE THE EGGS, THEY ARE THE BEST I’VE SEEN. Can I buy this stuff? If so how? Guns, guns, guns! I’m looking for a good time! :-) I also found some gun-looking wall hangers and a vase made of three Glock pistols (someone already mentioned it here). Looking for a gun style mailbox. What do you have?